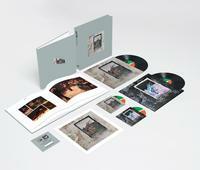 Led Zeppelin IV Super Deluxe Edition! The definitive edition of Zeppelin's fourth album, remastered by Jimmy Page! Prepare — no matter how many times you may have listened to their music, you've never heard Led Zeppelin like this before. Beginning with the spring release of deluxe editions of Led Zeppelin I, Led Zeppelin II and Led Zeppelin III, the band is launching an extensive reissue program of all nine of its studio albums in chronological order, each remastered by guitarist and producer Jimmy Page. Led Zeppelin will also open its vaults to share dozens of unheard studio and live recordings, with each album featuring a second disc of companion audio comprised entirely of unreleased music related to that album. • High quality prints of original album artwork, the first 30,000 prints numbered! The Led Zeppelin IV super deluxe edition includes unreleased versions of every song heard on the original album including alternate mixes of "Misty Mountain Hop" and "Four Sticks," mixes of "The Battle Of Evermore" and "Going To California" heavy with guitar and mandolin, and the fabled, alternate version "Stairway To Heaven," mixed at the Sunset Sound Studio in Los Angeles which lets fans hear one of the most revered songs of all time as they have never heard it before. "The material on the companion discs present a portal to the time of the recording of Led Zeppelin," says Page. "It is a selection of work in progress with rough mixes, backing tracks, alternate versions, and new material recorded at the time."